The book opens with the question it aims to answer: "What does God expect of us?" Richard Stearns, currently the president of World Vision, recalls just 60 days into his tenure having his bubble of easy-going security burst open. He had been the CEO of Lenox, a luxury tableware company. He lived in a ten-bedroom house, drove a Jaguar, and flew first-class to business destinations around the world. In those days his response to injustice and poverty was to change the channel, turn the newspaper page, or write a check to keep it all at arm's length. But soon enough he found himself echoing the prayer of his predecessor, Bob Pierce (founder of World Vision), "Let my heart be broken by the things that break the heart of God" (p. 9). The answer to that prayer unfolded, little by little, in his own life. Now, autobiographically, Stearns laments his former condition of apathy toward the plight of others. What was the problem? He insists, "[O]ur view of the gospel has been narrowed to a simple transaction, marked by checking a box on a bingo card at some prayer breakfast, registering a decision for Christ, or coming forward during an altar call....In our evangelistic effort to make the good news accessible and simple to understand, we seem to have boiled it down to a kind of 'fire insurance' that one can buy." He continues, incorporating the title and premise of the book, "There is a real problem with this limited view of the kingdom of God; it is not the whole gospel. 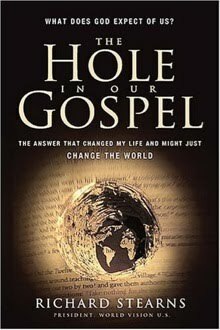 Instead, it's a gospel with a gaping hole" (p. 17). What would the gospel look like without the gaping hole? Stearns answers, "If we are to be part of this coming kingdom, God expects our lives - our churches and faith communities too - to be characterized by these authentic signs of our own transformation: compassion, mercy, justice and love - demonstrated tangibly" (p. 57). I found this book to be very engaging, challenging, and well-written. It is clear that Stearns is living the message he's proclaiming. He has experienced the best of times and the worst of times, and they have combined to form a powerful mixture of intelligence, clarity, and passion. Weaving together stirring stories, relevant Scripture passages, eye-opening statistics, and personal insights, this book makes a strong case for trading in the selfish dream of accumulation and consumption, and embracing God's dream of everlasting peace and generosity in the world. In the end Stearns advocates for neither optimism nor pessimism, but realism. He concludes, "The pessimist here sees only obstacles. The optimist sees only possibilities. But the realist sees the possibilities between the two. And that's who we must be. We must be people of the possible" (pp. 274-275). disclosure: This book was provided to me by Thomas Nelson Publishers. All opinions expressed are my own.